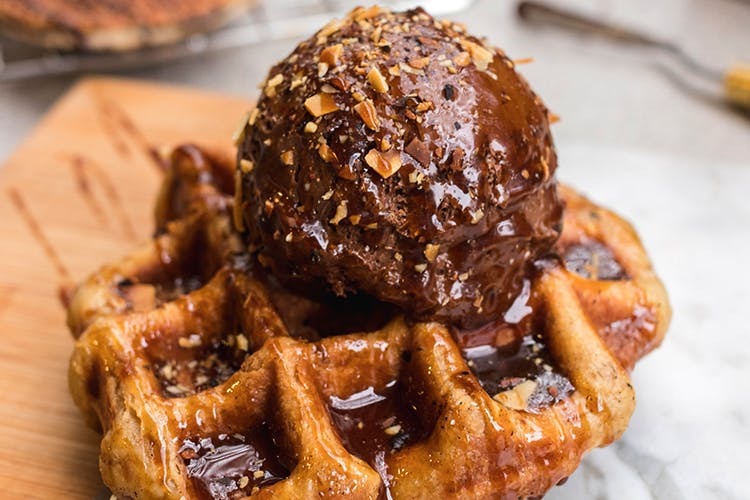 Dig into crunchy, airy liege waffles and stuffed stroopwaffles that come with marshmallow fillings at new the waffle kid on the block, The Waffle Press. Unlike the run-of-the-mill waffle places that are popping up at an alarming rate all over town, The Waffle Press makes everything in-house and keep the menu simple and clean. None of that overdose of Nutella, coloured waffles, or toppings. Start off with The OG, a no-fuss liege waffle that's crunchy and chewy at the same time. It's topped off with just the right amount of caramelised sugar drops and cinnamon powder. Just order them by half a dozen and just have them all through the day. If chocolate is your thing, don't miss out on The Dirty Duchess, a house speciality that comes with a super-rich chocolate mousse topped with a caramel sauce. Almonds add an extra layer of crunch. Stroopie and stroopie sandwiches (ice cream stuffing) are what you need to try next. Stroopies are stroopwaffles for the uninitiated. It's a thinner version of the liege, almost like a biscuit and comes with a filling. Our favourite filling is the marshmallow fluff and white chocolate ganache. Cookies and cream ice cream with cookie crumble is the go-to stuffing for your stroopie sandwich.